Happy New Year my dear readers. I wish you all a crafty and funny year. I started mine by finishing this mini project: this is a small pouch designed to carry my knitting essentials (tape measure, tapestry needle, scissors and waste yarn). I brought it over with me for my stay in France during the Christmas break as I thought hand stitching would be needed during this period of high excitement. I was right: I couldn’t have done without this project and my glittery blue mitten project (hand stitching is almost as soothing and relaxing as knitting). I chose to make some sashiko inspired stitching all over the pouch, because I couldn’t wait to try one of the techniques discovered in Zakka Sewing. I really love the way the colours work together and that the pattern repeats perfectly when the pouch is closed. The pouch is using a simple design of mine. The sashiko pattern is part of one of the patterns found here. There is some more sashiko in progress on my dining table, I’ll tell you all about this later. I can tell you this will be an embroidery year my friends! I also posted this project to this week Handmade Monday at the Handmade Harbour. Check out the other lovely makes there. It is amazing how much of a difference this stitching makes. It is really clever the way that it matches with the flap. Great job! Thanks. I was also amazed how the stitching works well with this simple cotton fabric. 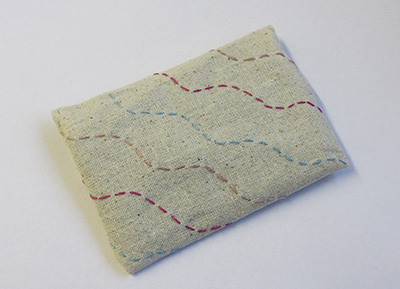 I really love the beauty but simplicity of this little pouch. And I agree about the stitches matching the flap, that IS amazing. 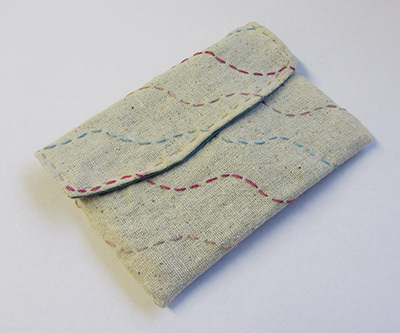 Thanks but it was not that difficult: I stitched and then folded to make the pouch. 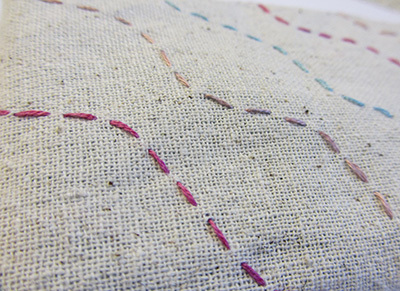 I love how the bright coloured lines of stitching work on the natural fabric – gorgeous. Thank you very much Wendy. I have to say I like to explore combinations of natural with other colours. Beautiful little clutch. I absolutely love it. If i hadn’t already made such a long list of projects for this coming year, i would be diving in!!! But one day I hope to have one very similar. You really did a beautiful job on this one. Thanks Pam, if you find time in your busy craft schedule, I would love to see what you make.